At this writing, we still don’t know if there is a Frequency season two. So we can be thankful that the Frequency creators wrapped up the show’s possibly only season rather neatly. Sure, there’s a (slight) cliffhanger at the end, but meh. Deacon Joe walking his dog is hardly enough to make us even be anxious about whether season two occurs or not. But before that, all of our timelines energetically careened toward each other, with two Robbies and a couple of Deacons (I’m still confused: why does the Deacon look so much older in 2016 now than he did before? Prison life? Does that also cause hair loss?) Julie (Jules) is alive, and hears her grown-up daughter’s voice on the radio. Daniel and Raimy are engaged. Satch is still with his family. Gordo is a lawyer (presumably to honor his father who was shot by Robbie?) and his wife and kid(s?) are still invisible. As we learned in The Flash, if something is not perfect in the present, you can’t go back and fix it so that everything works out. Raimy wanted to protect the world from the Nightingale. But in her new timeline, Gordo’s dad gets shot and Meghan gets killed by her brother. This doesn’t appear to have a ton of ramifications for Raimy’s new, improved life, until the very end. For a season that was likely to end on a up note, this episode still adeptly built up the suspense in its final agonizing minutes. We’ve seen how the past affects the present, so it seemed completely reasonable that Raimy could lose her entire engagement party (excellent fakeout with the dimming lights), less likely that Frank would fall for Robbie calling him out, or realize that the spare key was missing. We got thrown some stuff, like Stan taking care of his father to show that he had a good side (mentioning the money from his improved salary as a reason for him to go corrupt? ), and getting shot by Frank’s ex-girlfriend Miracella, I guess just to prevent him from helping Frank. Her dad just wants her to go be happy with her reunited fiancé and her resurrected mom, but Raimy, for better or for worse, is a cop. A cop with gnawing instincts that are not going to rest until the Nightingale is stopped for good. The Robbie twist was expected (and effectively revealed last week), but over 13 episodes, the show did an excellent job of building up who exactly that killer would be, especially when we started out with just a hoodie and a truck on fire. Sure, we never really got a resolution on that ring-of-corrupt-cops plot, but Frank got his family back, and solved the biggest case of his career. 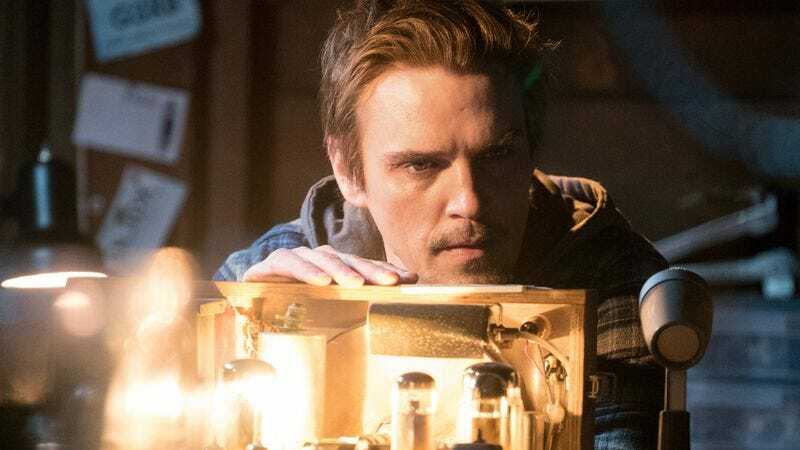 Frequency eventually wisely focused on those parts of the series, which were working much better than some other parts. Raimy and her dad’s final conversation over the ham was probably their best ever, and an important reminder of all that Raimy and the ham radio accomplished. When the show started, Frank was a disgraced cop with a short life, and Raimy had grown up thinking her father was corrupt. Now she realizes that her father was a good man, and they found the Nightingale killer. Pretty effective for a ham radio, even an unexplained magical one. Season grade: B. The show got a little dark and dour, but I appreciated its inspired take on cause and effect, and all the performers drew me in. Especially (the other) Peyton List: Roger Sterling’s second wife, who knew? Even if Frequency never comes back, it might actually qualify for One-Season Wonder status. Anyone else think that Frequency was leading up for the big reveal of Frank walking into that 2016 engagement party? Missed opportunity, show! Sure it wouldn’t have made a ton of sense (what does?) but it would have opened up some huge questions for next season. Although now the radio’s broken, so what would next season really entail anyway? Also, anyone else think in the show’s first few moments that Raimy was actually going to be engaged to Gordo? Meghan’s fate may be the saddest of all: Tracks down her long-missing brother with the help of Frank, only to get murdered by him. Deacon Joe asking his son if he’s insane is a bit of a rhetorical question, right? But no matter what urges he has, Robbie has to get that starting to kill again while the supposed Nightingale is in prison would be an unwise move that would blow the entire case wide open again. So long, Kyle: Guess you were basically only around to run a license plate. Also, so long, meta 1996 soundtrack. Hey everyone, thanks for reading. I think we were a small but mighty group. And if you love time travel, don’t worry, there’s still Time After Time, Making History, and the return of 12 Monkeys still to come!